“Gillian Brown and Inga McCaslin Frick have shown together in the past, and they paired up again for this two-person exhibition of video installations at the University of Illinois’s I Space. In separately conceived works, both artists explore perception as it relates to our thought processes and imagination. While Brown’s videos interact with sculptural objects, Frick incorporates sound with projected images. For a work titled Insight Out (eye diagram), Brown constructed a three-dimensional multipart model diagramming sight. A small video camera projects, onto a sandblasted portion of a large glass globe, an image of the artist writing the number one on a blackboard. 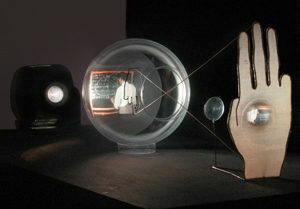 The projection is then refracted through a lens, mimicking real vision, as it is refocused upside down onto a large cutout Plexiglas hand, the fingers pointing skyward. There is a small inverted wire hand suspended within the globe connectid to the large hand with criss-crossing wires that form an “X.” In the video, as Brown makes her marks, the numbers shift and change, fading into various diagrams and formulas, becoming metaphors for the progressive history of mathematics. Frick’s Turnaround (Unstill Then) presents a compendium of footage projected on the front and back of two translucent screens placed 8 feet apart. Her identical but unsynchronized image sequences are focused both on and through the screens, producing complex interactions and movements. Everyday scenes (children on playground equipment, newspapers blowing in the wind) float by, slow down and are overtaken by passing clouds and flying birds. In various degrees of focus and blur, this play of imagery is both meditative and discordant, as the accompanying audio is also out of sync.